Aprende sobre la historia culinaria húngara. Dirigido por una guía de sommelier. Hoja de notas incluidas para grabar notas de cata. Al hacer la reserva, elija una hora de degustación a las 15:00, luego diríjase a The Tasting Table, ubicada en Bródy Sándor utca 9, Budapest 1088. Admire los techos abovedados de la bodega del siglo XIX, bajo los cuales se encontrará con el sommelier residente. Este experto en vinos será su guía durante toda la experiencia de degustación de 1.5 horas, y está abierto a cualquier pregunta que pueda tener sobre el vino o las regiones vinícolas. Escuche sobre el renacimiento artesanal de queso y charcutería en Hungría después del final de la era comunista. Pruebe algunos de los mejores ejemplos del país, que incluyen salchichas de res, pechuga de pato ahumada, salami de búfalos de agua y salchichas de cerdo mangalica. Beba cinco copas de vino elaboradas con variedades autóctonas de uva húngara, incluidos algunos vinos locales que son difíciles de encontrar en otros lugares. This is a fun thing to do in Budapest. Unusual and informative. Small group means it’s relaxed and you can talk to your table mates easily. I highly recommend it! Just an amazing experience, fabulous wines and nibbles, well worth the cost. This was an awesome wine tasting! We did the afternoon option and there was just the two of us. Greg was great-very knowledgeable and gave a good introduction to the wines, grapes and regions of Hungary. Some of the wines we had here we later had at a Michelin star restaurant-talk about quality! There was no pressure to buy anything, but we ended up getting 2 bottles and they bubble wrapped them for us. It was a very enjoyable experience that we would highly recommend! So great! Well worth the price. Lovely location and great hosts. They even bubble wrapped our purchases! We chose the afternoon tasting rather than the busier early evening one and received individual attention as we were the only party. It is held in a atmospheric cellar room which was just right for the experience and Angela gave us an insight to the wine producing regions of Hungary. We tried 5 different wines and these were accompanied by a good size and typical Hungarian platter of meat, cheese and breads. Afterwards there is the opportunity to buy wines if you wish, however, there was absolutely no pressure to do so. We would recommend this experience. Excellent. Very personal. Lovely wine and atmosphere and an excellent somellier who knew his wines, history and Budapest. Would highly recommend this. Great value as well. 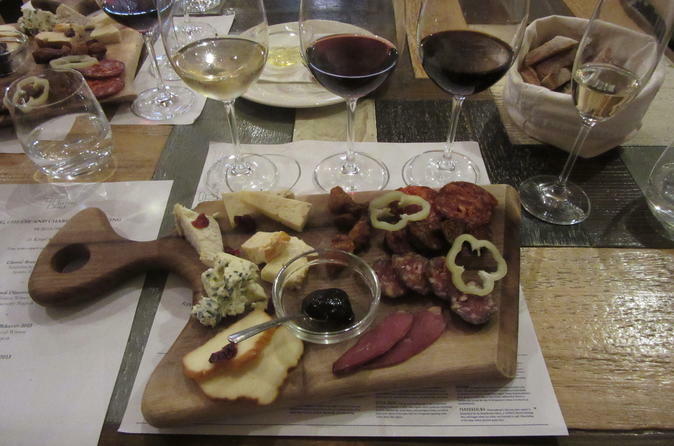 Fantastic introduction to Hungary's wine, cheese and Charcuterie. Our guide (Gary) was brilliant, he explained all the wine producing regions and the history behind each delicious wine. The 'Bullsblood' was sensational! This is the perfect introduction to Hungarian wines and wine regions while visiting Budapest. 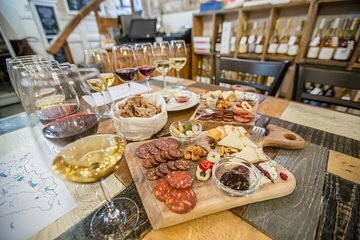 The tasting is held at a gorgeous subterranean wine cellar called the Tasting Room, very centrally located on the Pest side of the city. Our host spoke perfect English and the hour and a half flew by,and my husband and I were the only people signed up for our 3 PM slot. We first tasted a delicious Kreinbacher sparkling wine from the Somlo region, followed by a riesling and two lovely reds Bull's Blood and a red blend, all from different Hungarian wine-growing regions. We then were served an incredible cheese and charcuterie plate - WAY more than we could eat and all fabulous. We ended with a fabulous tokaj which was the perfect treat! This was an awesome experience and a highlight of our time in Budapest. This was one of the best things we did in Hungary. The amount of knowledge from the person was amazing about Hungarian wines, and the portions were incredible. Highly recommend!! !